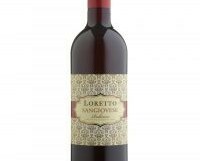 Marks & Spencer Loretto Sangiovese Rubicone IGT 2016. A light fresh juicy easy-drinking wine with red cherry fruits and a twist of spice. No tannins, just light, supple, rounded fruits. A good all-rounder to drink with lighter red meats, chicken and pork, as well as salmon or tuna. You cannot ask too much of a wine selling for less than €10. 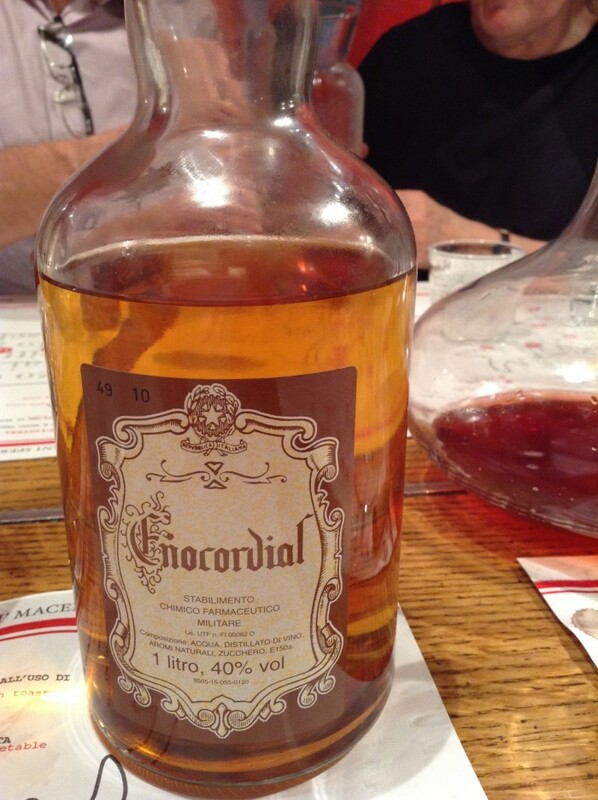 I find most have a confected flavour from over-manipulation and usually a dose of residual sugar. 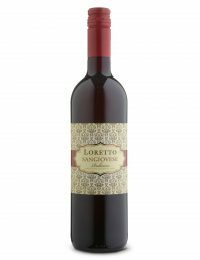 You won’t mistake this wine for a top Chianti Classico, but it is a very gluggable fault-free wine and offers very good value for money. Rufina is the smallest zone within the Chianti region, with a mere 600 hectares of vines, just 4% of the total Chianti area. By comparison Chianti Classico has 10,000 hectares. Originally it was simply called Rufina and is one of the oldest defined wine regions, not just in Tuscany, but the world, having been mentioned in an edict by Grand Duke Cosimo III de’ Medici in 1716. The largest producer is Frescobaldi, the next-door neighbour of Selvapiana, who grow one third of the vines and bottle half the wine. Selvapiana has been owned by the Giuntini family since 1827. The estate covers 250 hectares, with 60 under vine. 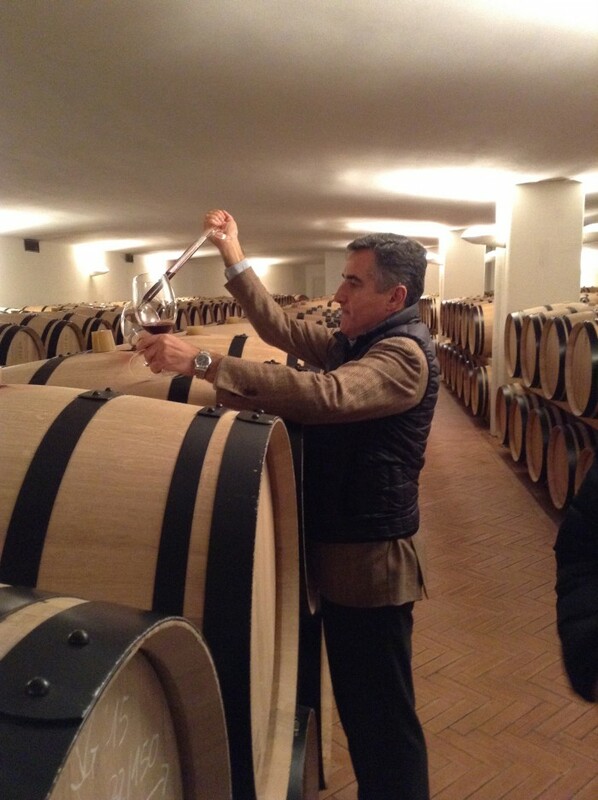 Francesco Giuntini, whose mother was an Antinori, did not father any children. When he put the property up for sale in the 1980’s, the estate manager’s son Frederico Masseti said he would like to buy it. In the end, Francesco adopted both Francesco and his sister, so both will eventually inherit the estate. “Rufina’, says Frederico, ‘ is more northerly, more inland, with a cooler climate and a longer growing season. We get 800-900 milimetres of rain each year, and the temperature usually never rises above 32 degrees. Climate change is making viticulture more difficult for us; now you don’t get rain, you get floods!’. 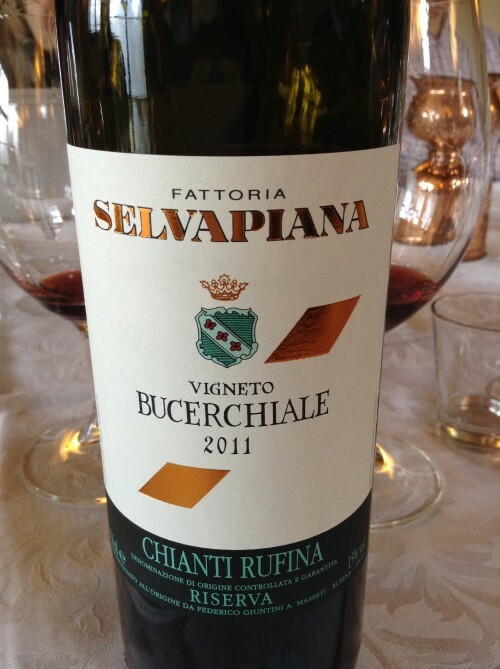 I am a big fan of the Selvapiana Chianti Rufina; it is always light and refreshing with lively crunchy Sangiovese fruits. The 2014 is a classic of this style. We also tried the attractive unoaked cool climate white, a blend of Chardonnay and Petit Manseng, and the firm tannic Pomino 2011with its blackcurrant fruits. The stars were two vintages of the Bucerchiale, the first single vineyard wine produced in Tuscany. The 2012 seemed more forward and developed than the correct, firm tannic 2011; both are excellent wines, and in context, represent very good value for money. I have tasted a few excellent old bottles. 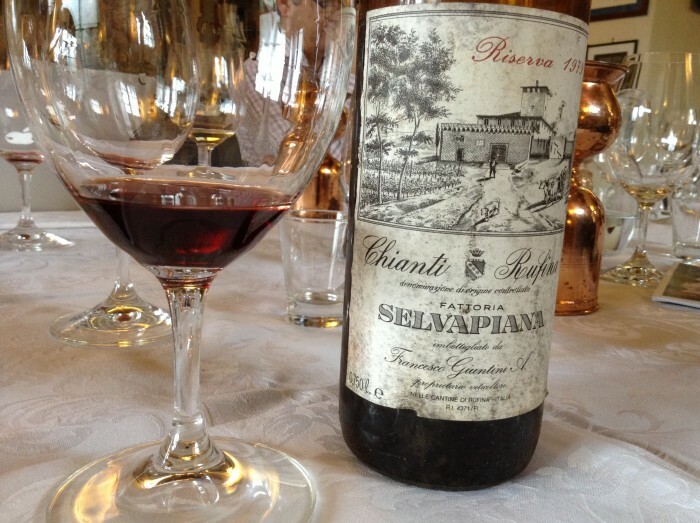 We tried the lovely mature 1979 Chianti Riserva with lunch. Overall these are great wines, and well worth searching out. 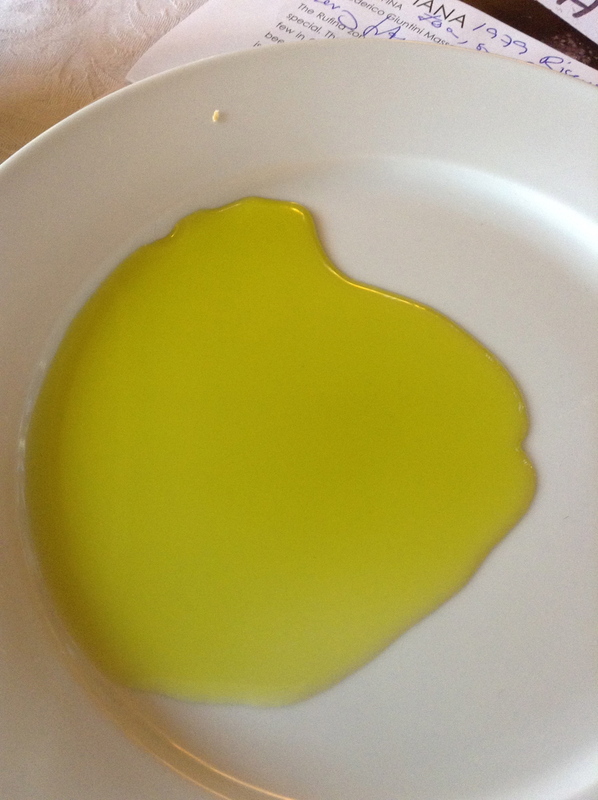 Selvapiana makes the most distinctive peppery, green olive oil of all. 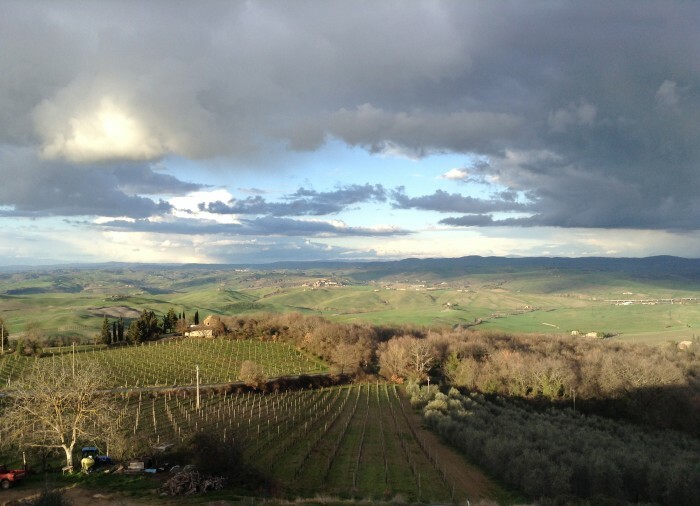 Back in 1979 Francesco Giuntini said to David Gleave that ‘some people in Tuscany may make better wine than ours, but nobody makes better olive oil’. The 2015 is currently available in specialist shops (I bought mine in 64wine, Glasthule) and worth looking out for. A wonderfully expressive nose, a full intense palate of firm dark cherry fruits and a long dry finish. The quality of the fruit here is excellent. Keep for a decade or decant and drink now. Extra Virgin Olive Oil – the greenest, most peppery of all. 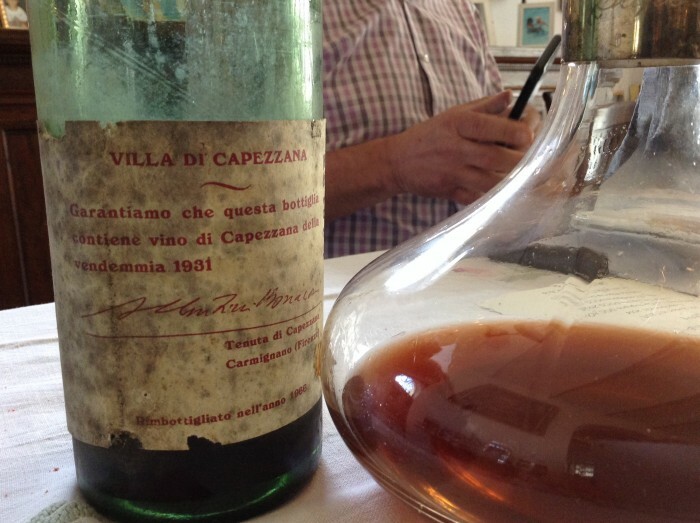 Capezzana can claim to be the oldest estate in Tuscany, with evidence that it was producing both olive oil and wine in 804 (not 1804 note!). They still do both today. As with many Tuscan estates, it was originally owned by a noble family from Florence (in this case the Medici) who used it as a country retreat and summer residence during the Middle Ages. In the 1920’s, the Contini Bonacossi family bought Capezzana from the Rothschild family and set about restoring the property. Hugo Bonacossi passed away in his nineties a few years ago, followed by his wife late last year. Both were driving forces behind the revival of both Capezzana and the Carmignano region generally. It is now run by the seven children, each with an allotted task. In addition to the wine and oil, they run cookery courses, offer accommodation and now have a successful wine bar. The estate is large, 650 hectares, mostly forest, but with 90 hectares of vines, and 150 hectares of olive trees. The Extra Virgin olive oil is excellent, and famously features in the recipe for cavolo nero in the River Café cookbook. It is available for sale in a number of wine shops and specialist food retailers. Lovely vivid pure blackcurrants and dark cherry fruits. Refreshing captivating wine. 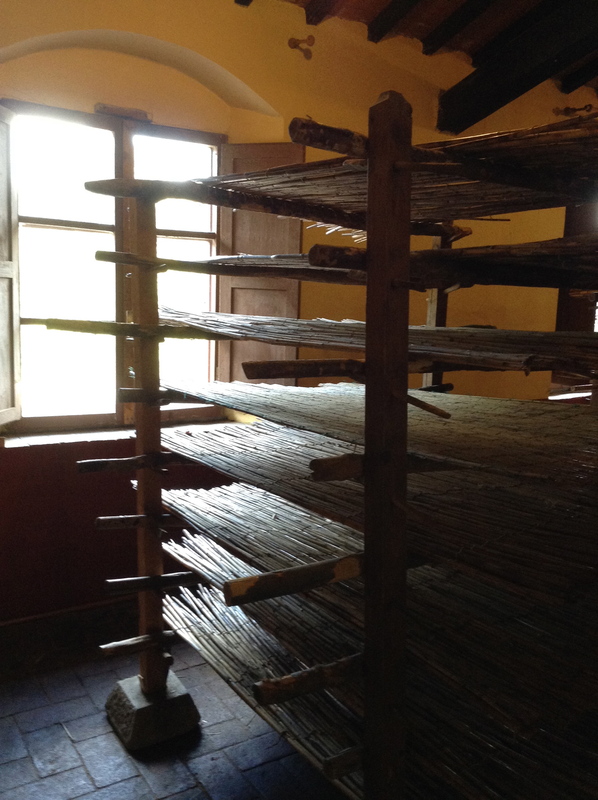 Mats for drying grapes for Vin Santo. The mezzadria or sharecropping system of agriculture continued in much of Italy until the early 1960’s. This semi-subsistence form of farming was not conducive to the development of specialised viticulture. In the 1960’s and 1970’s Chianti and the other great wine regions of Tuscany went through a very dark period, as farm labourers departed in droves for the cities. The owners were left with large estates and nobody to run them. Paolo de Marchi of Isole e Olena has aerial photographs showing how so much land was abandoned and left to run to forest on his estate. 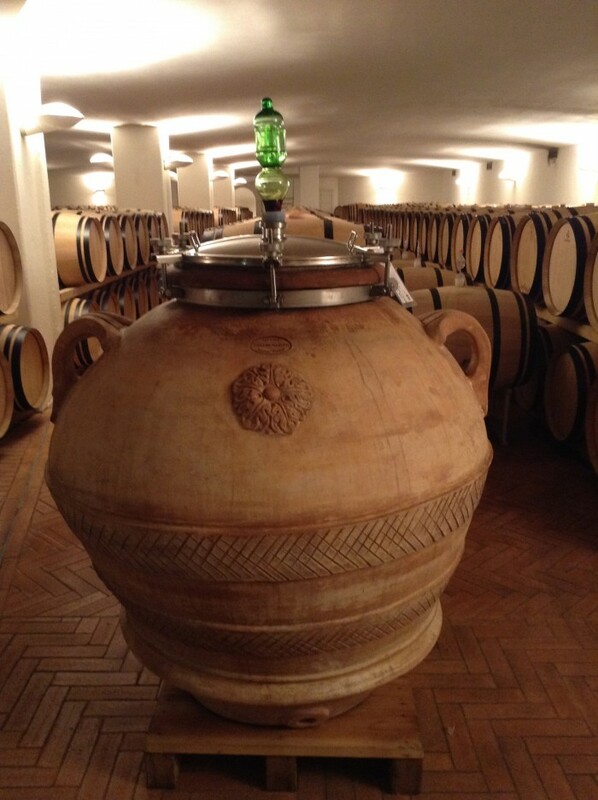 Demand for quality wine was low, and many were forced to produce large quantities of inexpensive poor wine, often in the classic straw bound bottle (fiasco) that many of us remember from Italian restaurants around the world. ‘We come from an unbelievable situation’, says di Marchi, ‘the world was changing so quickly. 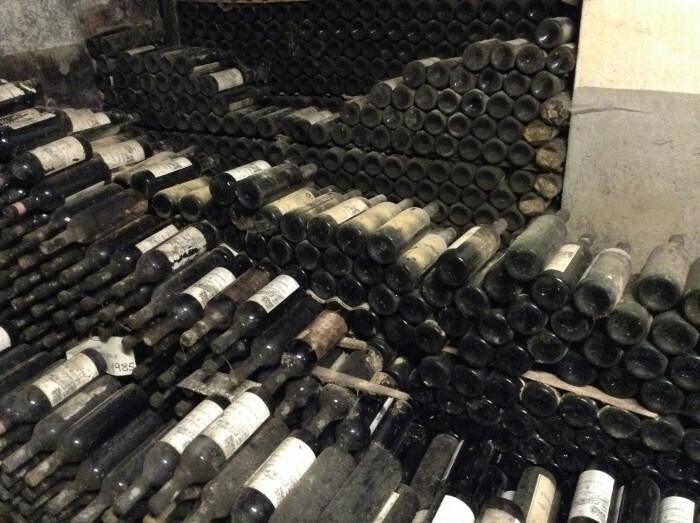 Yields of 80 hectolitres per hectare were allowed, including 40% white grapes, and of course, you could legally add 15% of wine from the south.’ It took decades, and the determination of men such as Pierro Antinori and others, to restore the reputation of Chianti Classico. Classico is the original Chianti region; a huge swathe of surrounding land has been allowed to adopt the name, despite having inferior soils. Even Chianti Rufina was originally known simply as Rufina. 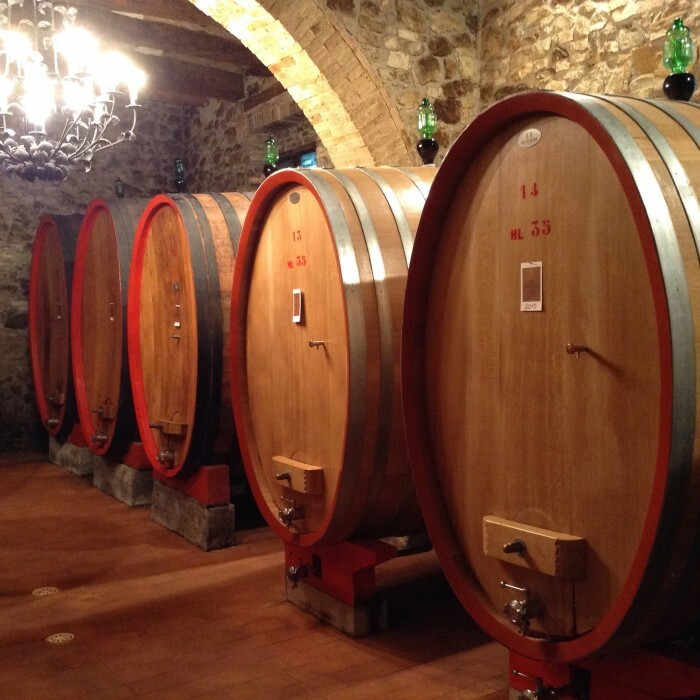 Today, thankfully, Chianti Classico and other regions of Tuscany are recognized as producing world-class wine. Most retain a distinctive character, largely down to the idiosyncratic Sangiovese grape, but also the varied soils and climate. It is also one of the most beautiful, picturesque regions I have visited. I imagine it must get very crowded in the summer, but a visit in the spring or autumn is not to be missed. A word about olive oils. 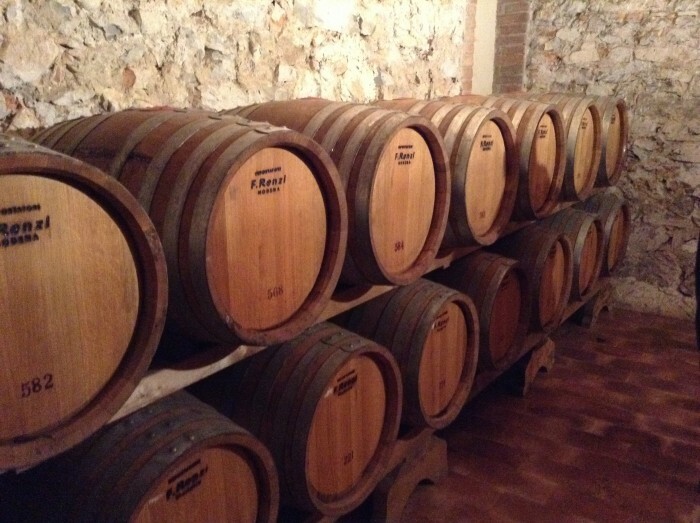 Many of the wine estates of Tuscany have traditionally produced olive oil. Encouraged by Liberty Wines, a number now use modern techniques to produce excellent Extra Virgin Olive Oil. New season olive oil is bottled in November or December, and can have an amazing flavour. Pour it on salads, vegetables, beans, bruschetta, or meats; anything in fact seems to taste better with a drop or two of good olive oil, and it is very good for you too. The fresh intensity of flavour lasts for about 4-6 months after vintage. Sadly the good stuff is very expensive, but it is worth it. I am completely addicted; a piece of sourdough toast drizzled with good olive oil and a sprinkle of Maldon salt is simple to make, but heavenly to eat. Celebrating St. Patrick’s Day? I am a little bored reading about Irish-related wines (some with highly dubious Irish connections) to drink on our national holiday. Instead two Italian wines that would go down nicely with any feast or celebration you may be planning. A refreshing crisp dry Soave with lovely plump pear fruits on the mid-palate. Great on its own, with lighter fish and seafood dishes, or, I reckon, with salads. Available from On the Grapevine, Dalkey; Cabot & Co., Westport. Soave covers all sorts of wines, from watery and flavourless to some of Italy’s greatest dry whites. This wine is probably somewhere in the middle; a good well-made wine with pleasant fruits. 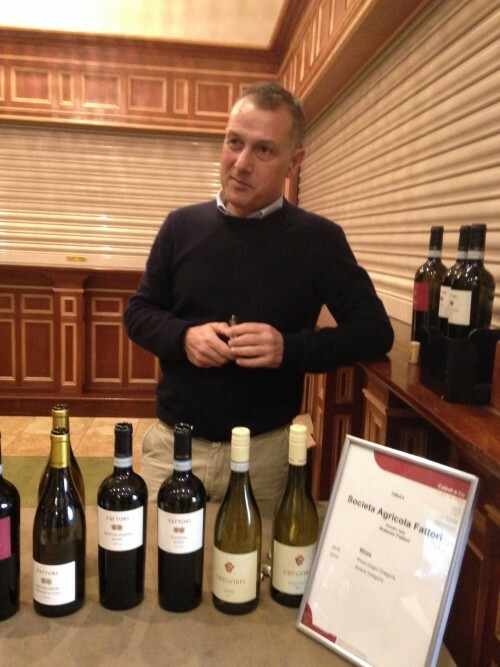 Antonio Fattori, who attended the wine weekend in Knockranny House Hotel a few weeks back, is a thoughtful winemaker. He also makes a pretty decent Pinot Grigio, and a few top-notch single vineyard Soaves. Sadly these are not available in Ireland for the moment. A wonderfully expressive nose, a full, intense palate of firm dark cherry fruits and a long dry finish. The quality of the fruit here is excellent. Keep for a decade or decant and drink now with red meats. Going a bit upmarket here, but it is our national day. 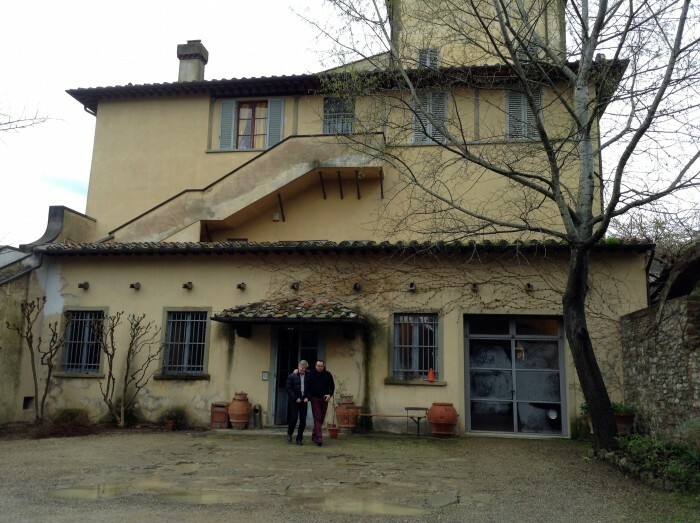 I had the pleasure of visiting Selvapiana last week as part of a recent trip to Tuscany. 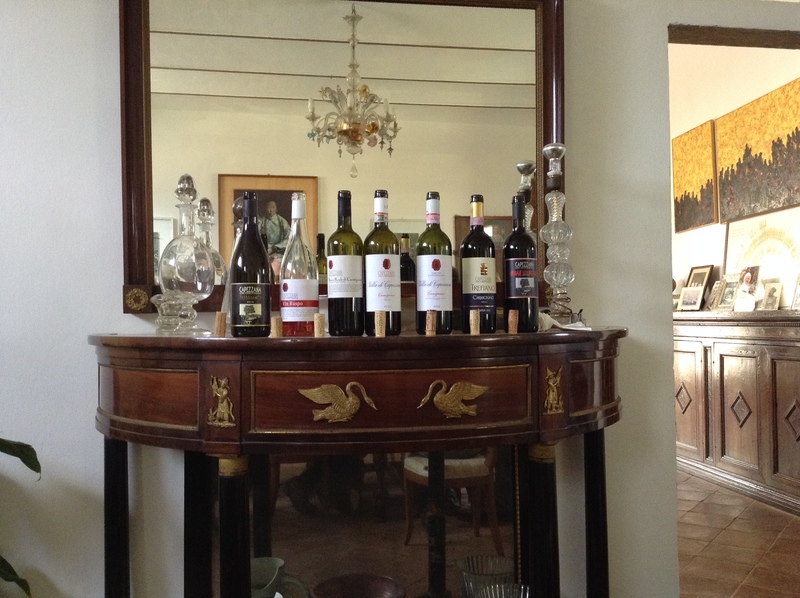 The tasting was in a lovely slightly decrepit old house, with very old paintings, furniture and carpets. The estate has been in the family of Fransesco Giuntini since 1827 -he is related to the Antinoris and most of the other Tuscan nobility. Having no children, he adopted the son and daughter of the estate manager many years ago. They now run Selvapiana in an exemplary manner. The basic Chianti Rufina is usually fresh and delicious, and the Riserva Bucerchiale, from a single vineyard, one of the best-value top wines of Tuscany. Day two started with a quick breakfast in Montalcino before heading off to Chianti Classico. This is a large estate, some 470 hectares, although vineyards cover a small percentage of that. 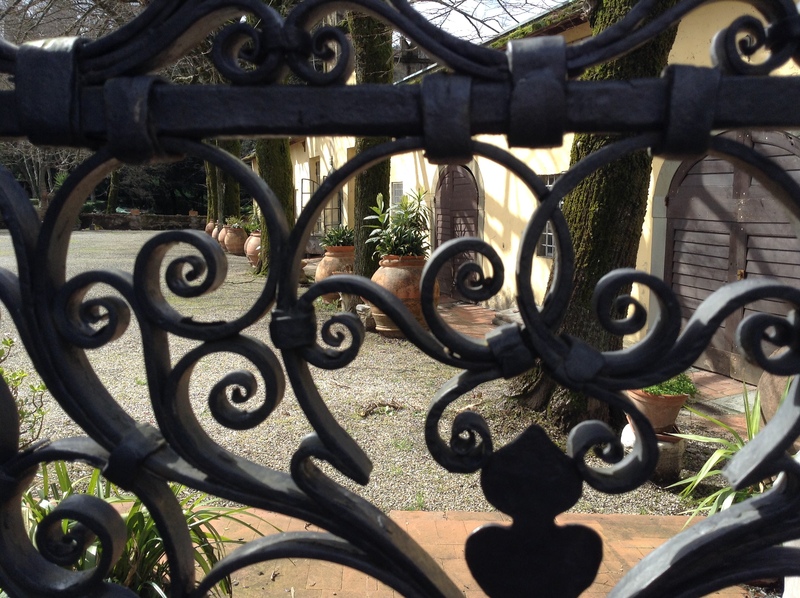 It is located right on the southern border of Chianti Classico, and is therefore one of the warmest parts of the DOCG. The wines are typically bigger and more powerful. The reflective Giusseppe Mazzocolin was in charge here for over thirty years, and it was he who showed us around. His background was as a history teacher and he has a keen interest in the past and local traditions. Fèlsina was acquired by his father-in-law in 1966, who asked him to run the estate. He arrived in the late 1970’s. Fèlsina is in the process of making safe an old house amongst the vineyards, once lived in by Benedictine monks. However, Mazzocolin does not want to restore it and start welcoming guests. ‘We are not hoteliers; no agritourismo here. People would come in their cars and drive everywhere.’ He says with a slight distaste. The ‘I Sistri’ Chardonnay (€29.99) had a very attractive distinctive beeswax/honey character and excellent pure fruit; the Chianti Classico 2014 was an attractive light refreshing wine. We then tasted three single vineyard wines, Rancia, Fontalloro and Colonia, all very different in style, followed by several mature vintages of Fontalloro, a 2003 Chianti Classico and an excellent Vin Santo. The 2006 Fontalloro was wonderful elegant fresh and grippy, the 1998 corrupt and meaty, still retaining some savoury tannins. Both were excellent, as was the 2012 below. 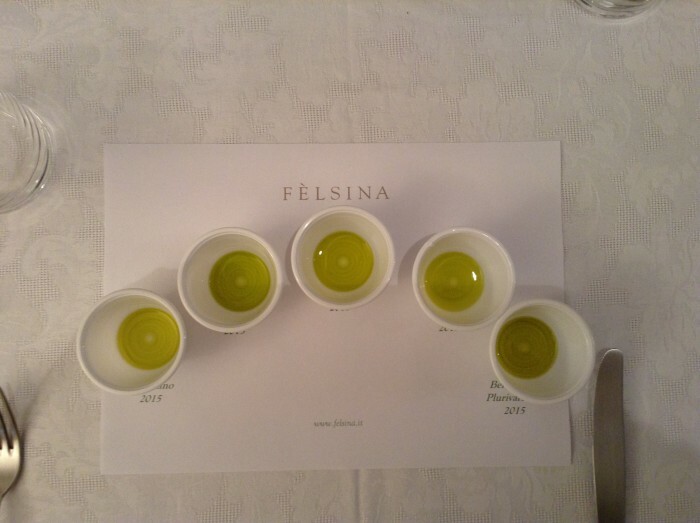 Like many estates in Tuscany, Fèlsina make an olive oil. We had a fascinating tasting of four separate varieties before trying the final the final blend. Quite delicious already, with an open-knit structure, soft ripe cherries and blackcurrants, refreshing on the palate and nice length. I cannot see it lasting as long as the two wines above, but very seductive now. Paulo de Marchi is a cultural historian and self-confessed dreamer who also makes some of the finest, most elegant wines of Tuscany. 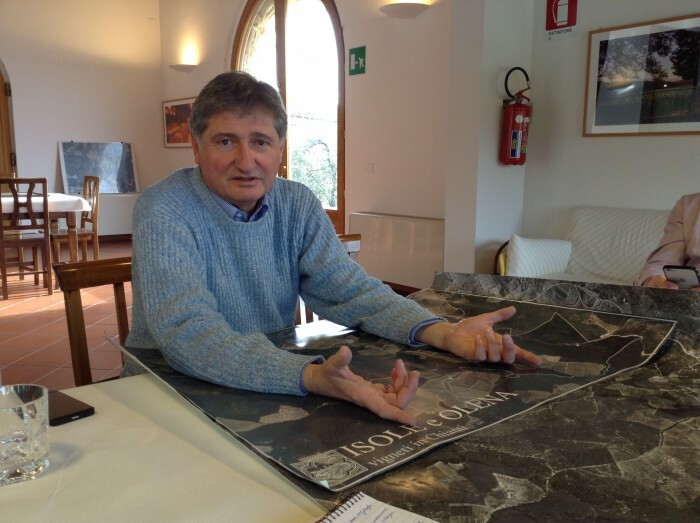 His father bought the Isole e Olena estate just as Italy was about to go through a very turbulent period. Up until the 1960’s many farmers worked as share-croppers, farming a few hectares of forest, olive groves and vines, often interspersed, with a few animals wandering around too. A percentage of their crop went to the land owner, often an absentee. As Italy went through a post-war boom, huge numbers of agrarian workers deserted the country, seduced by the possibility of a better life working in the cities, as promised on newly arrived TV sets. 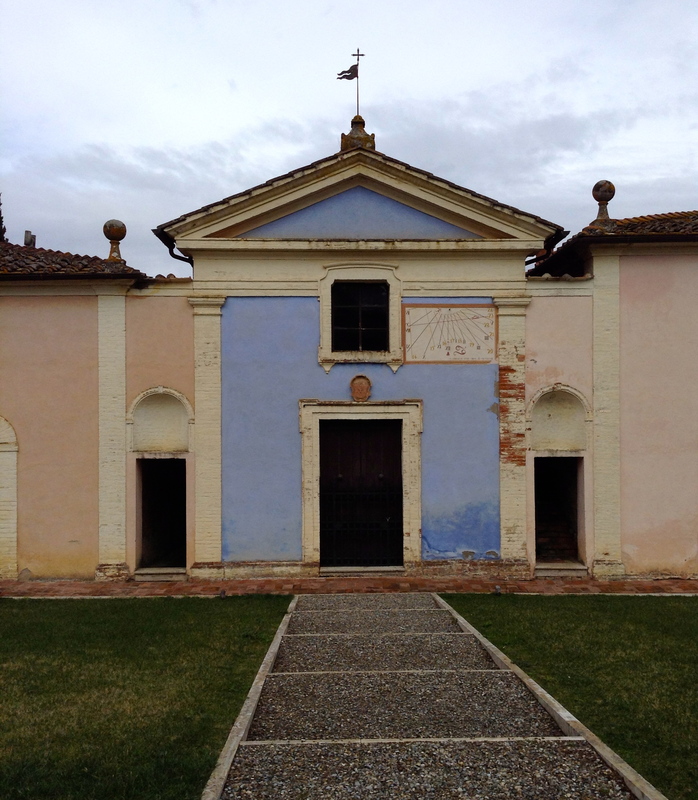 In the two hamlets of Isole and Olena, de Marchi explains, there were 120 people, a priest and a school in 1956. By 1964, there were 14 people left. 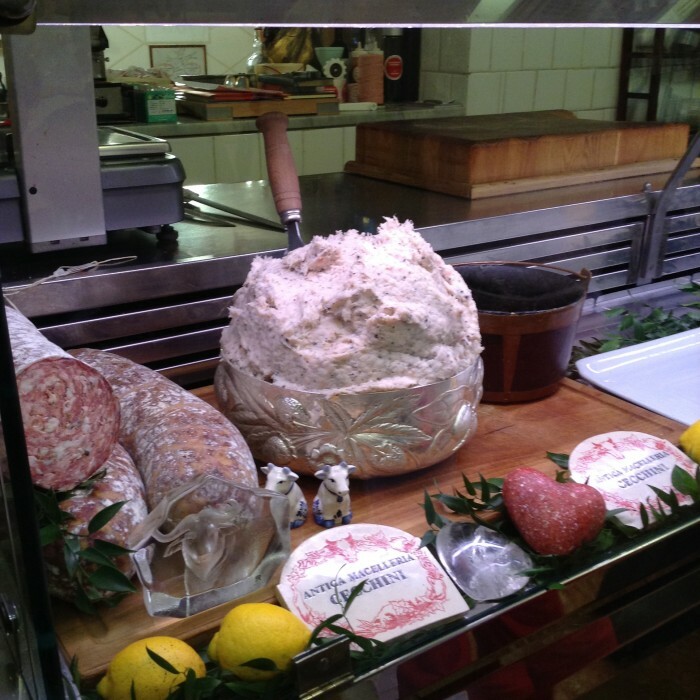 Di Marche has gradually renovated the entire estate over the last forty years. The wines are now amongst the finest in Tuscany. 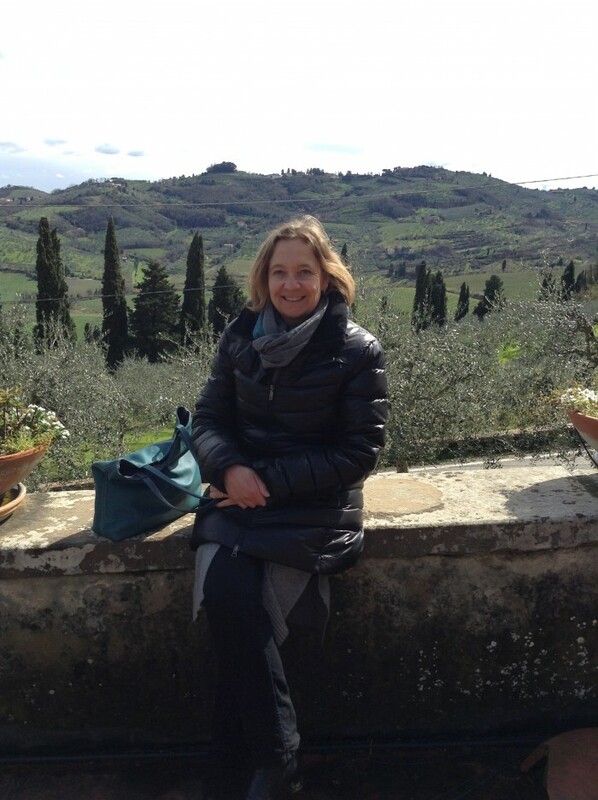 As David Gleave explained, although his vineyards are at roughly the same height as Fontodi nearby, they have a lightness due to the different aspect of most of the vineyards, and the winds that come in from the west. 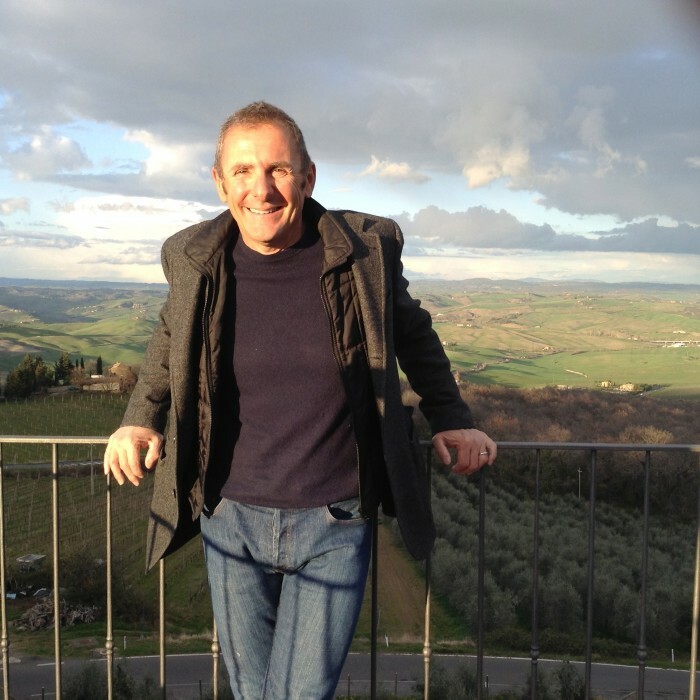 ‘With Sangiovese, you always have to balance acidity and tannins,’ says de Marchi. 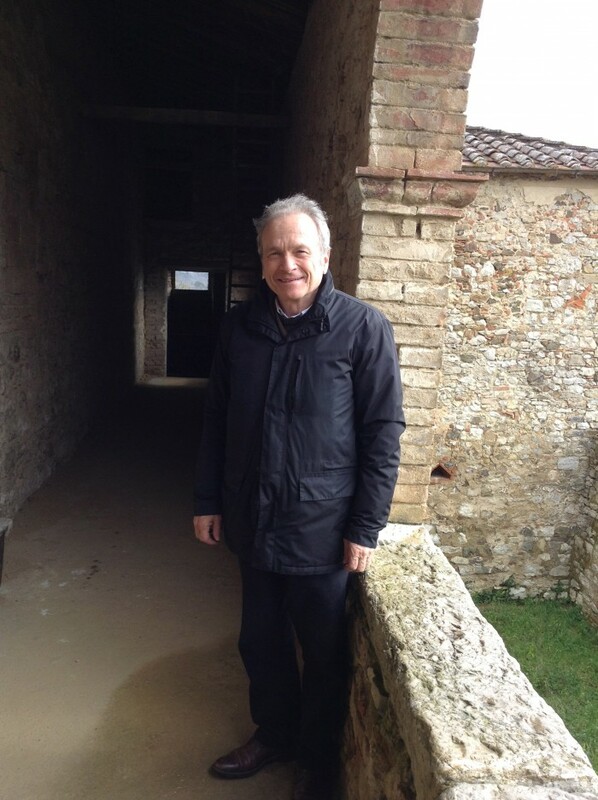 ‘I want ripeness but I want real freshness too.’ De Marchi was celebrating his 65th birthday the day we visited. His son Luca is currently working on another project in Piemonte, where de Marchi bought back the historic family estate. The results so far have been spectacularly good. The Chianti Classico here is distinctive and very good. We tried the 2013 and 2014; I preferred the first. 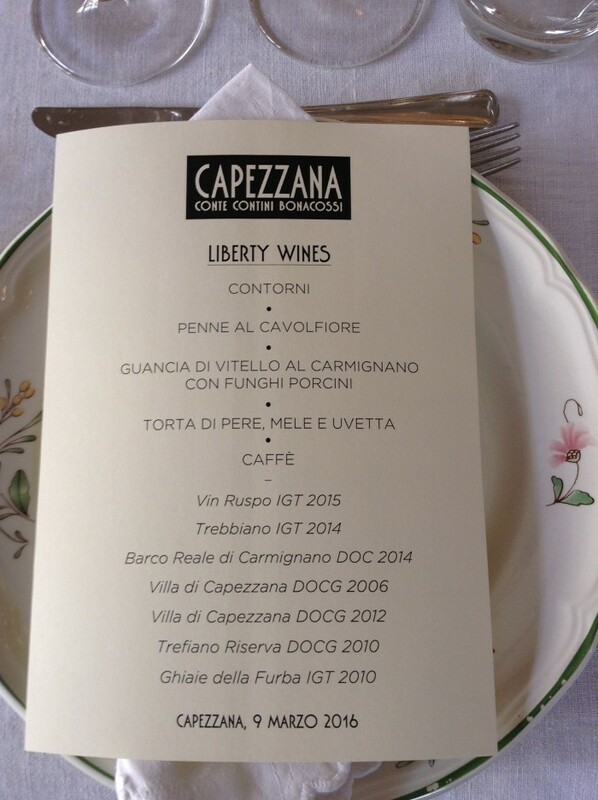 We then tried three vintages of his amazing Cepparello, a 100% Sangiovese Super Tuscan. The 2006 was exceptional, but the current 2012 and 2013 vintages showed real promise. I would love to have both in my cellar. 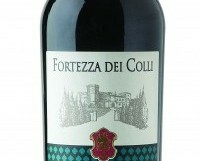 The 2008 Syrah Collezione Privata was another star, as was the 2006 Vin Santo, a wine that sells out quickly every year. Still showing some new oak, but a beautiful silky-smooth wine with good acidity, a well-integrated tannic structure and delicious ripe dark cherry fruits. Lovely wine. Couldn’t leave this out, one of my favourite wines, from the far north of Italy, the original de Marchi family home region. Made from Nebbiolo, this is a stunning silky wine with delicate rosehips and red summer fruits. 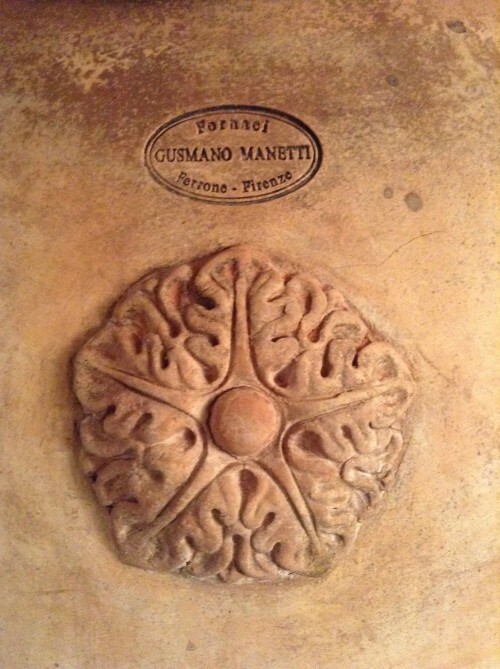 The Manetti family bought Fontodi in the Panzano region of Chianti Classico in 1969. 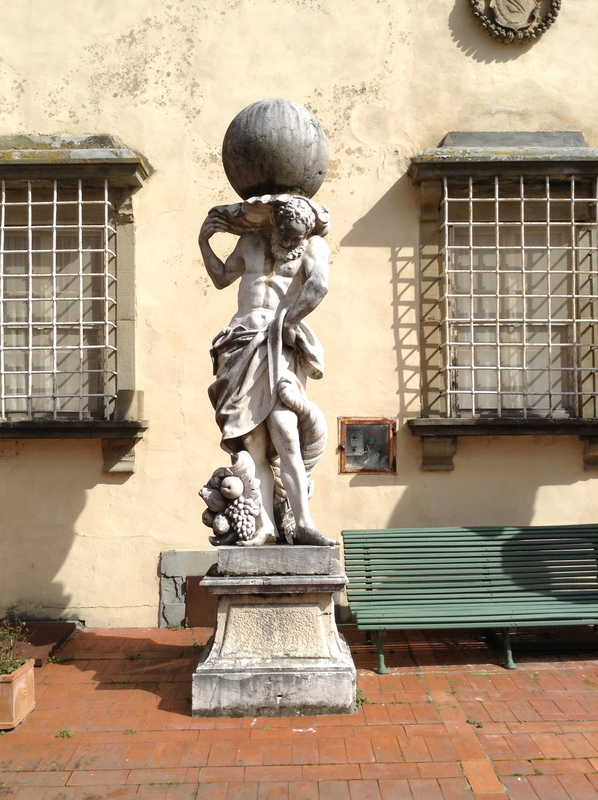 They had been running a terracotta factory in nearby Ferrone for centuries (and still do). Apparently Manetti moved the family here when the two sons were schoolboys. Giovanni Manetti describes it as a huge culture shock for him and his brother. 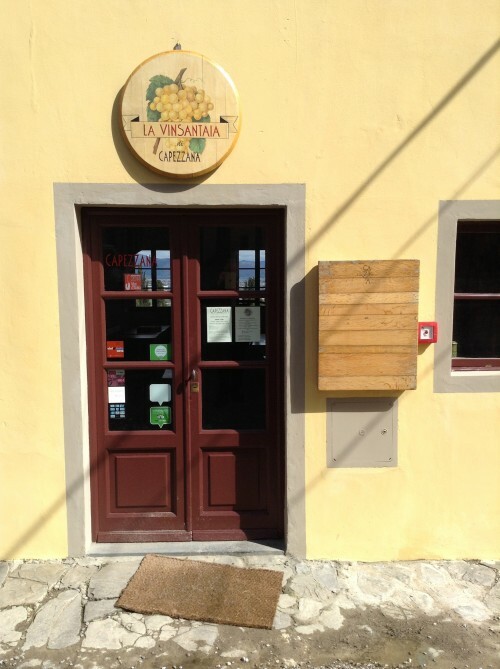 They started out sharing the reponsiblities for the winery and the factory, but Giovanni eventually took over the wine side while his brother (who has a house on the estate) runs the terracotta business. 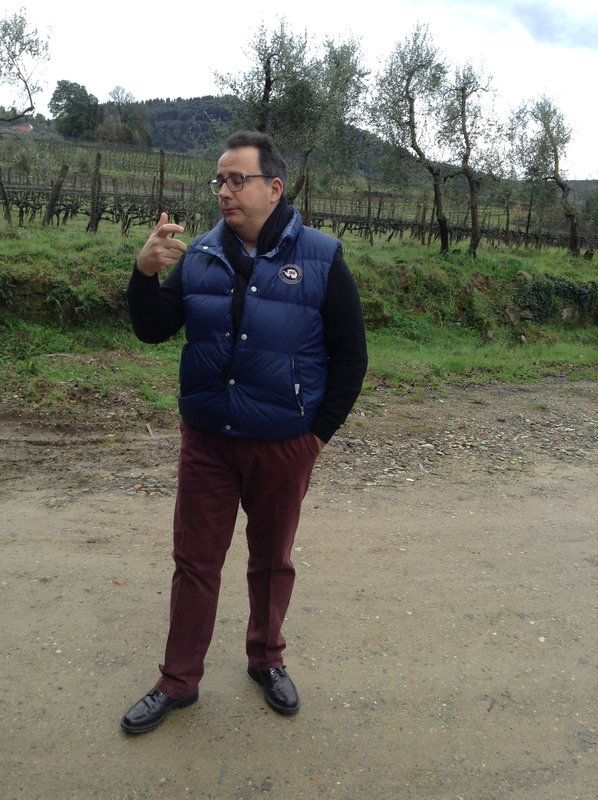 The amiable but driven Giovanni Masetti has increased the vineyards from 10 to 87 hectares, all located in the conca d’oro, a shell-shaped basin that has some of the best exposure and soils in the region. He is fully organic and part biodynamic – ‘without the preparations, but yes to the moon’, he says. “I like to do it and it works’. The Panzano area is trying to become the first official organic region in Italy; currently there are fifty producers growing organically. The major pest in recent years has been deer who eat the grapes. 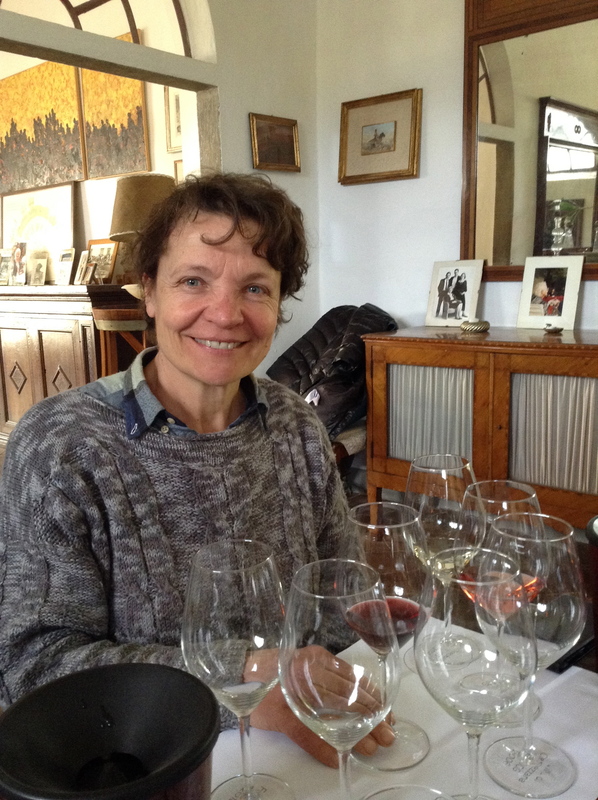 ‘I put a fence around the vineyard and saved 50 thousand bottles’, says Manetti with a smile. 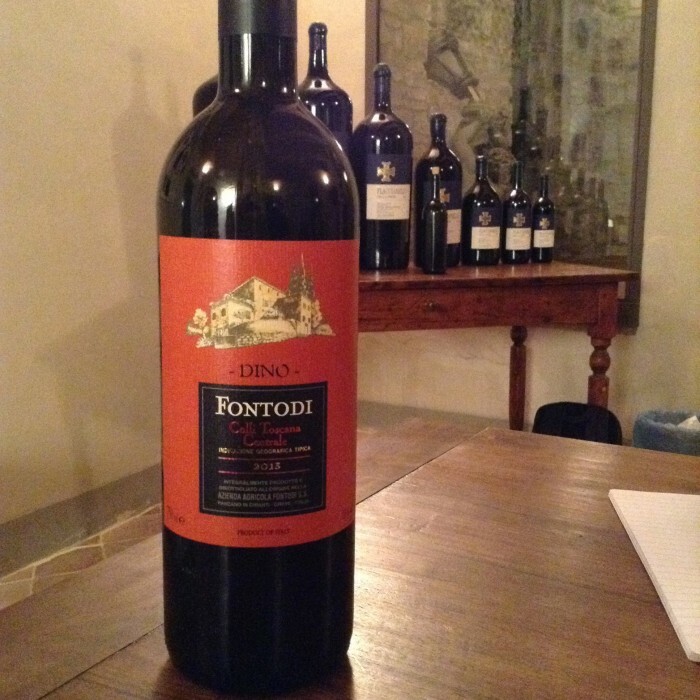 The Fontodi wines are big and powerful, with excellent structure; they mature very well, and really should be aged for a few years. At home, I am working my way through a stash of 2006 and 2007 at the moment. We tasted a Sauvignon Blanc and a Pinot Noir, but it was the Sangiovese wines that impressed most. As well as the Chianti below, there was the Vigna del Sorbo 2012, muscular yet somehow refined as well, with a good tannic structure, and the flagship Flaccianello della Pieve 2012, a wine with a big reputation, made from the oldest vines on the estate. This was a massive tight, foursquare wine, with a lovely fragrant nose, but will need a few years to reveal its true glory. Look out too for Dino, a wine fermented and aged in clay amphorae. As the other family business is terracotta tiles, Giovanni was in the perfect position to source all the amphorae! The wine is excellent with zippy strawberry fruits, good acidity and real length. Big, firm muscular ripe fruits; very good intensity and plenty of ripe tannins. Would benefit from a couple of years ageing, but an impressive wine. 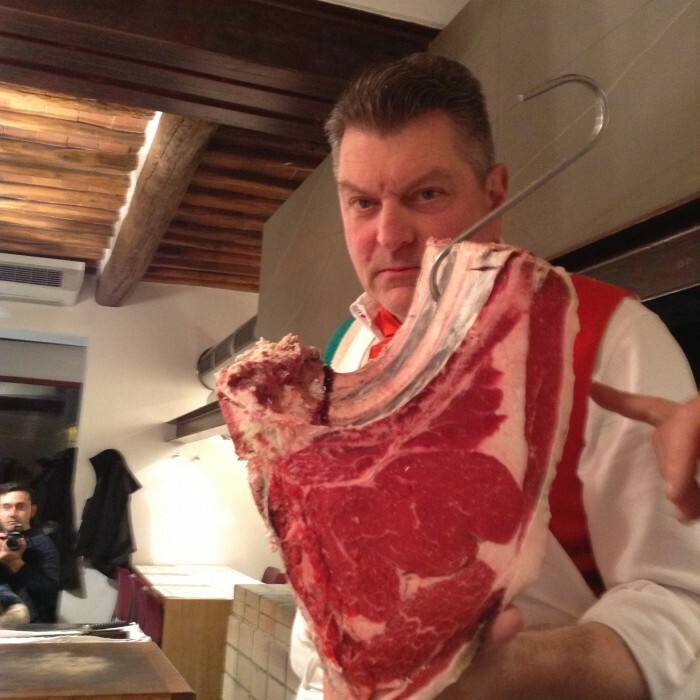 Giovanni then took us off to eat at the other famous establishment in Panzano, Anitca Macelleria Cecchini run by the irrepressible ‘mad butcher of Panzano’, Dario Cecchini. 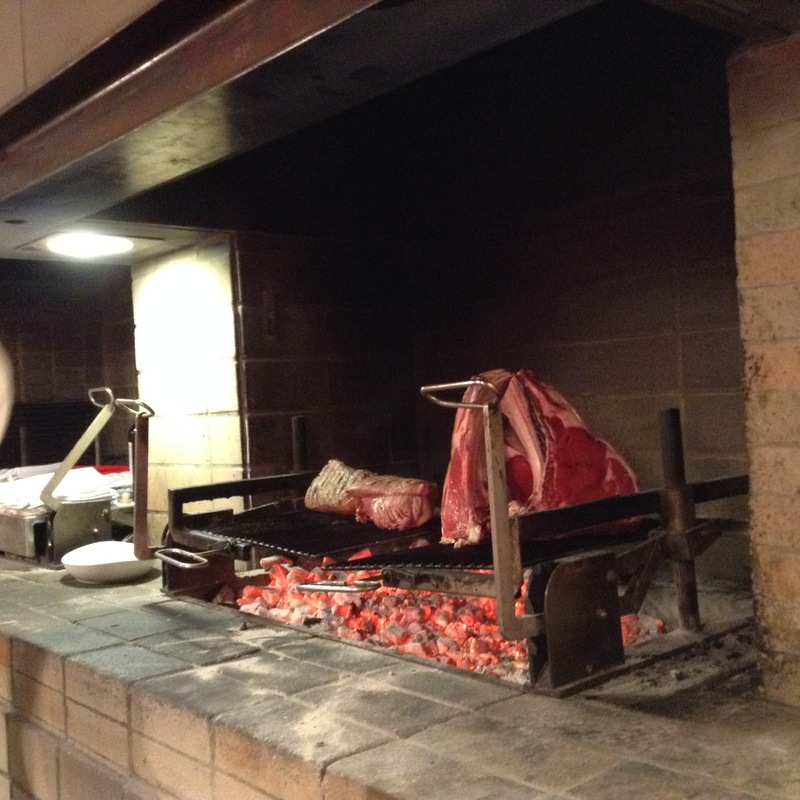 This is part theatre (see YouTube) with a six course all meat dinner, and an experience to be remembered. Having eaten the best part of a Chianina steer (grown by Giovanni on the Fontodi estate), we finished up with Italian military liqueur and escaped to bed. 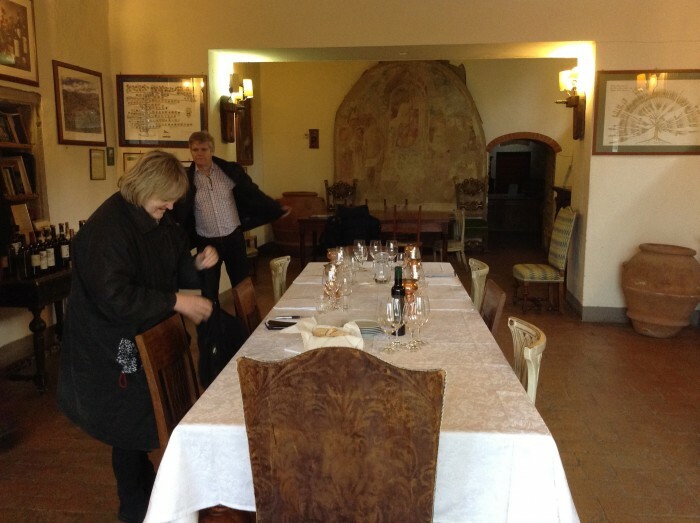 Day one of a three day trip to Tuscany with David Gleave of Liberty Wines. I hadn’t been there for a few years, so it was great to refresh my knowledge and to wonder at the beauty of the area. Not surprisingly some superb food too, including seriously good extra virgin olive oil. 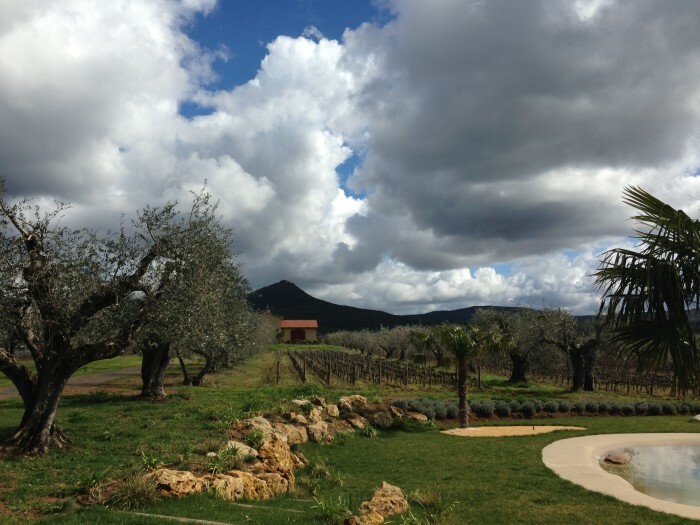 Poggio al Tesoro is based in Bolgheri, a one of the most sought-after strips of land in Tuscany. It includes two of the most famous wine names of Italy, Sassicaia and Ornellaia. Poggio al Tesoro belongs to the Allegrini family, very highly regarded producers in Valpolicella, who acquired it in 2001.This is the region that became famous for producing Cabernet Sauvignon (with Sassicaia) and then Merlot (with Ornellaia). Since then Cabernet Franc has also produced highly successful. Bolgheri is a relatively flat region close to the sea, which mitigates the climate. Further protection is provided by the mountains immediately behind. The Poggio al Tesoro wines are rich and powerful but not without a certain elegance. I enjoyed them all, the reds having a very smooth sultry ripeness cloaked in suave new oak. However, the wine that stuck out was the white, a Vermentino. This is a grape variety that is widely grown in Corsica, Sardinia, and the south of France; in the right hands it can make very good textured wines with a lovely balance of acidity and rich fruit. Rich peach and pineapple fruits textured and long with a welcome acidic streak. Very good wine. We tried an older vintage over lunch which was excellent. 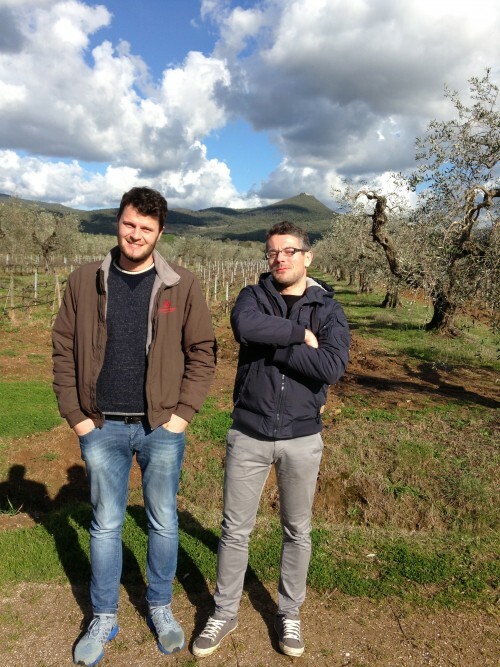 We then had an extremely pleasant lunch with winemaker Lorenzo Fortini, and his colleague Riccardo Fratton (pictured above) of San Palo, an estate in Montalcino that is also owned by the Allegrini family. Both are from the Veneto. 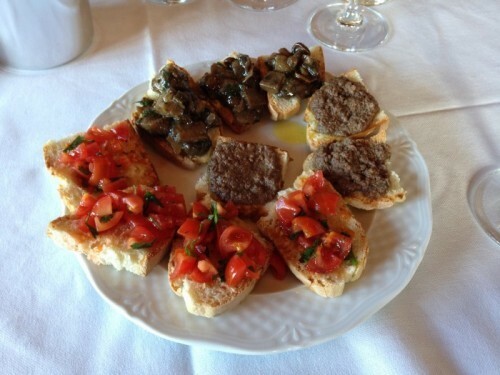 Classic Tuscan Antipasti – Liver, mushroom and tomato bruschetta (or crostini?) with plenty of good olive oil. 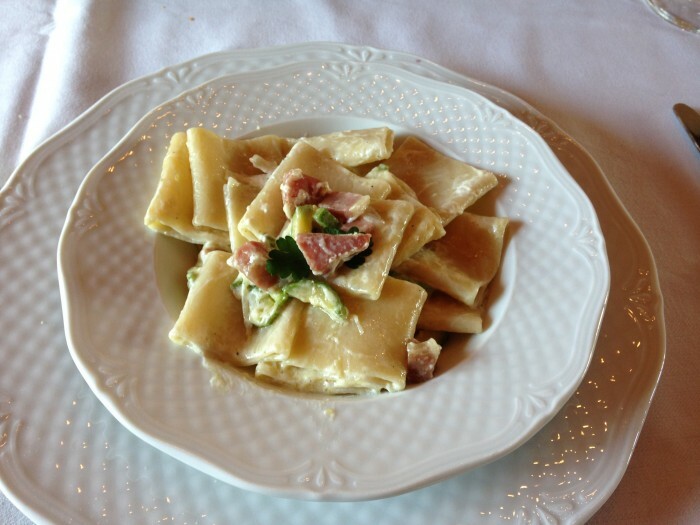 Pachiare – Tuscan pasta with ham, butter and cheese. 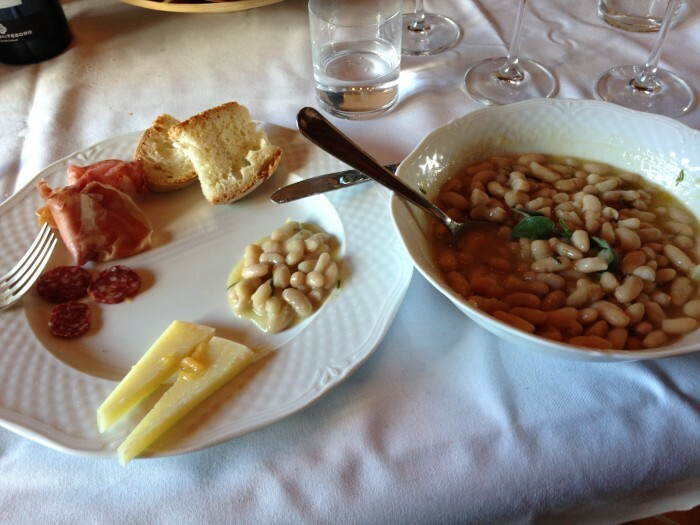 Then on to beans (delicious), salume, and pecorino with honey. 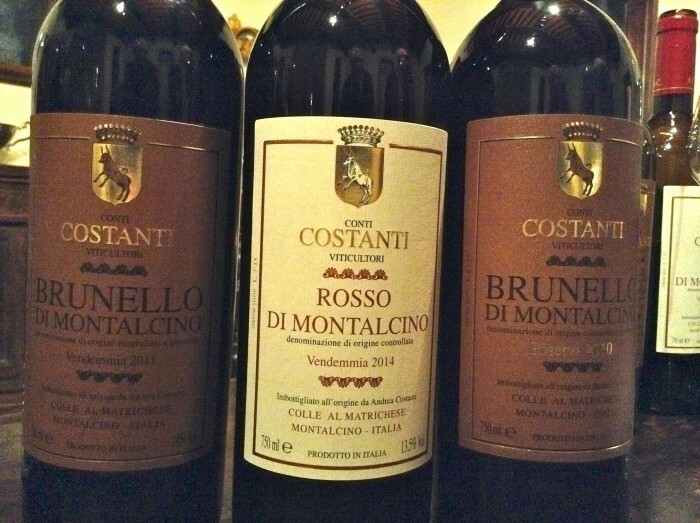 We then moved on to Montalcino, home to Brunello di Montalcino, one of the great wines of Italy. Strangely, it is only in the last few decades that the region has found fame, largely thanks to an American love affair with the wine. The wines vary greatly, but at their best combine the aroma, delicacy and freshness of Pinot Noir with some of the firm tannic structure of a Nebbiolo. Given its popularity and relative scarcity, Brunello is never going to be cheap. Expect to pay €40 for a Brunello and €150 for Brunello Riserva. Thankfully the junior Rosso di Montalcino can be very good n the right hands, and is also ready to drink much sooner. A good Brunello will age gracefully for many years, and really needs a decade to become approachable. I have been a bit dubious about the wines of this region in the past, but certainly these two estates produce some wonderful wines. Like much of Tuscany, it is a stunnigly beautiful and well worth visiting. 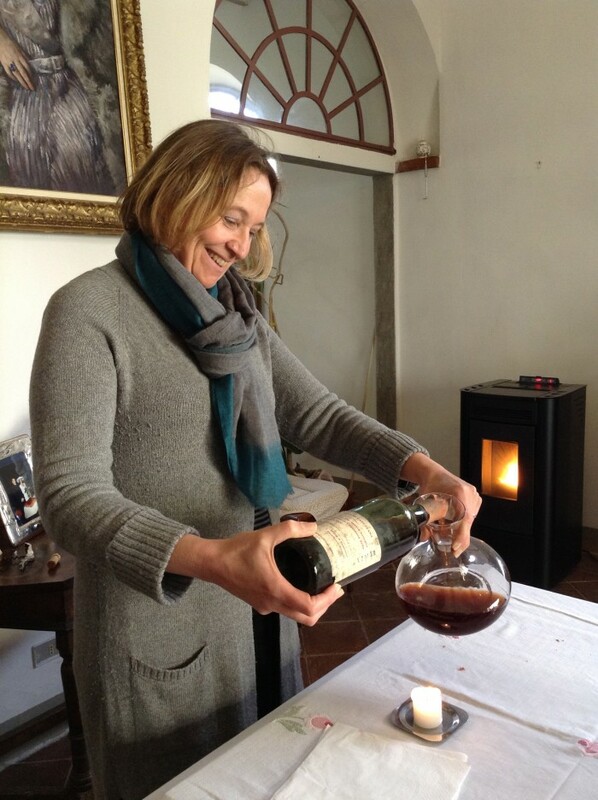 In 2006, the Allegrini family bought two neighbouring estates in Montalcino. This is a small contiguous 16 hectare vineyard, with vines planted in 1990 and 2000. The winery, built in to the hill, is a small perfectly formed building, designed to be as eco-friendly as possible and full of ingenious features. We tasted three impressive structured Brunello di Montalcino, the 2009, 2010 and 2011, as well as a superb, massive Brunello Riserva 2010. More approachable in price and style is the Rosso di Montalcino below. A classic Sangiovese nose of dark cherries; lovely fresh dark fruits on the plate with good acidity, lingering nicely in the mouth. In your dreams, this is the sort of estate you would love to own; a very small winery producing great wines, perched on top of a hill with amazing views, close to a medieval town. And there are some really great wines at Costanti; an irresistible combination of elegance and power. All of the Costanti wines were delicious, from the fragrant, elegant, Pinotesque Rosso di Montalcino 2014 (€35), the breathtaking but closed 2010 Brunello Riserva (€150) as well as the wine below. The 2015s we tasted from cask were utterly amazing. 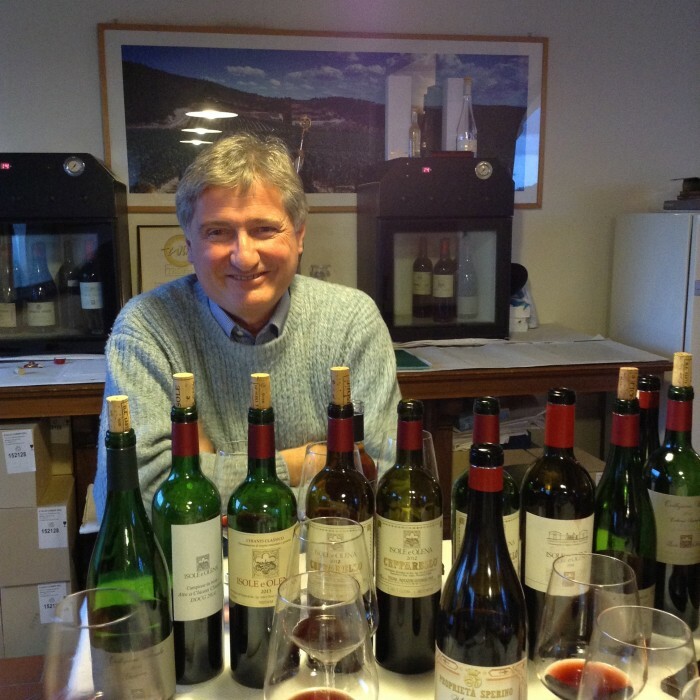 Costanti believes it is the best vintage since he started in 1983 (obviously beating the much hyped 2010 vintage),. Over dinner, we enjoyed the 2004, 2006 and 2007 Brunello Riserva, all with that same supreme elegance. The 2006 stood out for me. A wonderful expressive nose, floral with hints of mushrooms, followed by an elegant, refined palate, still quite young, with ripe red fruits, some spice, and a dry finish. Lovely wine. Supple soft red cherry fruits and a tannin-free finish. Simple easy-drinking all-purpose wine. Chianti usually falls into one of three categories; the first covers most of the cheap versions. These are acidic, scrawny, nasty and undrinkable. Then there is the second category, usually but not always from the posher sub-region of Chianti Classico. These are sublime wines, with lifted dark cherries, good acidity and plenty of tannins. They are great with red meat and game. They are also expensive; expect to pay €20 and more; a lot more for the very best. The third category covers a small group of wines that are soft and supple with lush sweet ripe fruits. They don’t taste very like Chianti, which tends to have high acidity. Nor do they have the complexity of a top Chianti Classico. But they are very gluggable on a Wednesday night. The Lidl version is a part of this grouping; inexpensive and light with very easy rounded fruits. For €10.49, you can’t really go wrong.